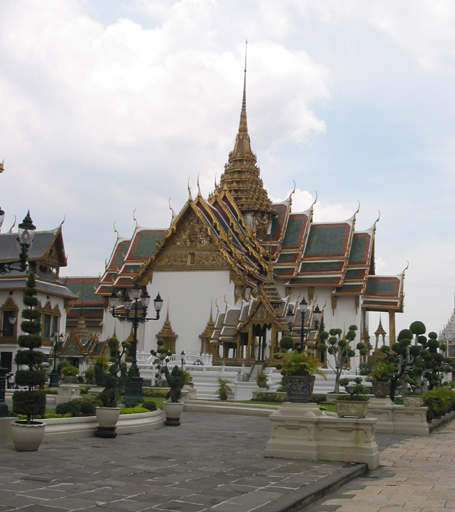 Bangkok, the capital, was founded in the 1700's and seems to have grown spontaneously ever since without much planning or control. Expressways, a sky train and other innovations to reduce the traffic jams have made improvements, but they started behind the traffic power curve and may never catch up. 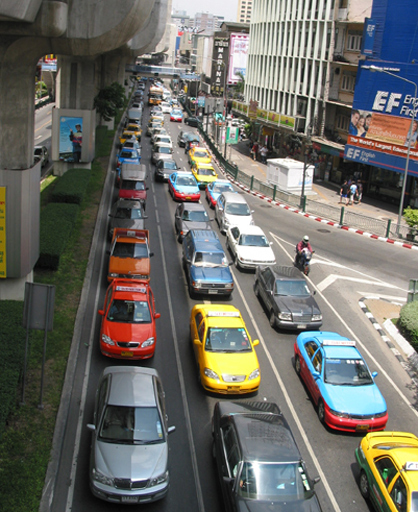 Still, the traffic, the sprawl, the seediness, the modern sky scrapers and expansive shopping malls all come together to make Bangkok a city like no other. Although we felt it necessary to be aboard Callisto during the repairs, we did manage to get away for a three day visit in this special city. 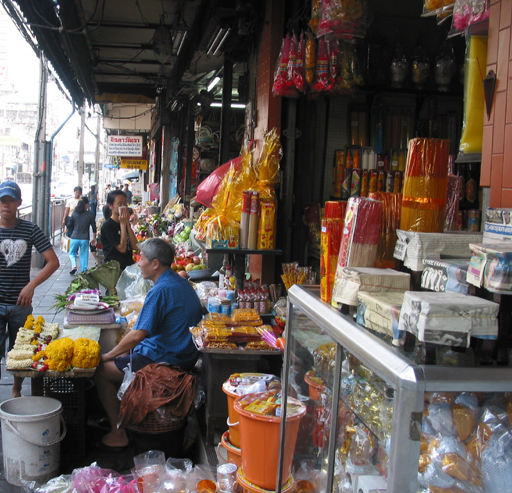 Like other cities in Southeast Asia, overcrowded shops spill out onto the street side making almost every street interesting to stroll down. 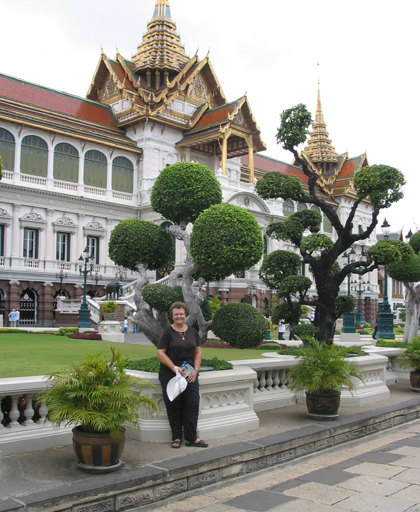 The Grand Palace is a 60 acre site containing royal monuments, royal offices and temples. The structures in the background are built in three different Buddhist styles. 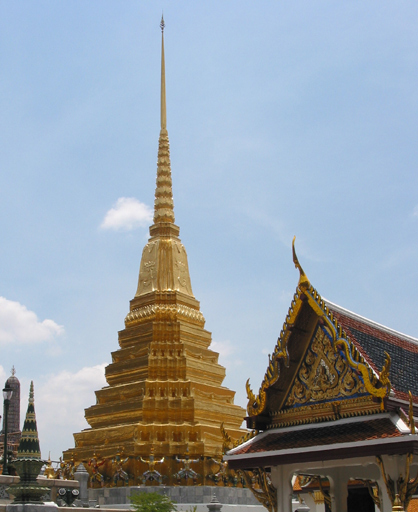 The Golden stupa is in Sri Lankan style, then the library in Thai style and the royal pantheon in Ankor style. This Sri Lankan demon is a character from the Hindu classic Ramayana, the story of Rama. 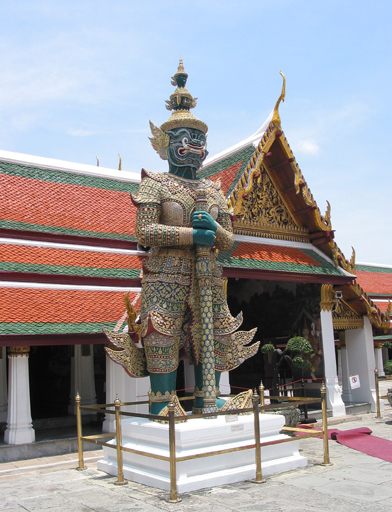 He stands guard out side the temple of the Emerald Buddha. 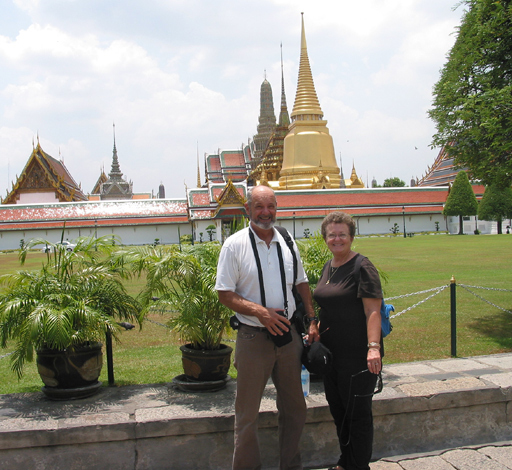 The Emerald Buddha is jade statue about 27 inches tall that is the most venerated Buddha statue in Thailand. The image wears seasonal costumes that are changed by the King personally. This stupa is surrounded at its base by alternating monkey gods and Lankan demons, both characters from the Ramayana, who at times were allies and at others enemies. 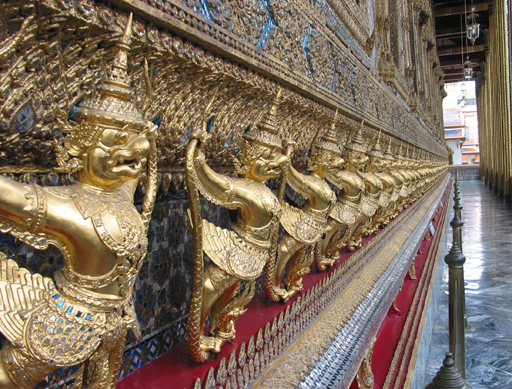 Many of the mythological characters from Hinduism are found in Buddhist imagery. The current royal family no longer reside in the Grand Palace, but it still houses many of the offices of the royalty such as His Majesty's Principle Private Secretary and the Bureau of the Royal Household. 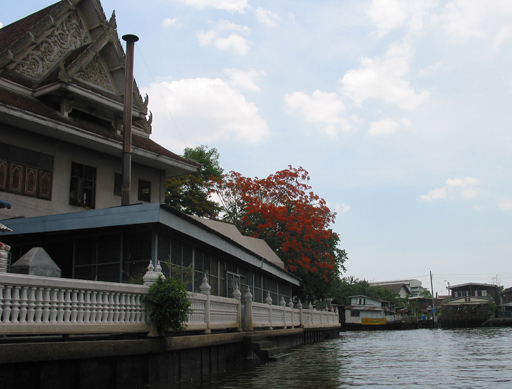 Bangkok is built on the flood plain of the Chao Phraya river and was once a city of canals and floating houses. Early European visitors called it the Venice of the East. Many of the khlongs (canals) that once ran through Bangkok have been filled in, paved and are streets. 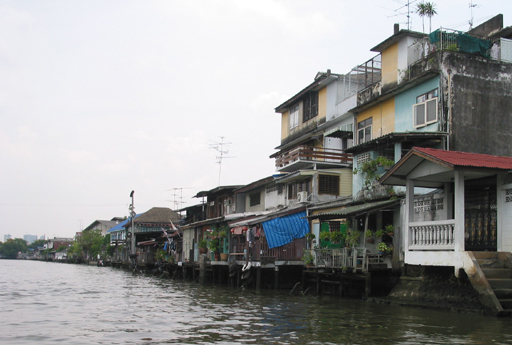 The khlong is still an important part of the Bangkok scene and many houses still front on a khlong. However, unlike in the past there is probably a street and a motorbike on shore side of the house. Once the khlong was the major avenue for transportation within the city, it is still used for transport, but most goods go by road. There is still a regular water bus service that runs in the khlongs and as always it provides a cool place for boys to be boys. Charts on this site are reproduced from Microsoft™ Encarta™ 2006© All rights reserved.